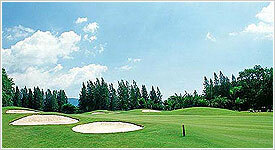 Phuket Laguna is a Phuket resort golf course with pleasant breezes from the Andaman Sea. It is not too demanding and reflects the natural beauty and tropical surroundings of Bang Tao Bay. 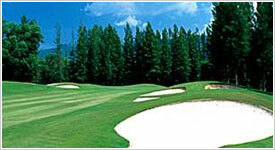 This Phuket golf course is set on a valley floor overlooked by low wooded hills. The fairways flow nicely, the bunkers are molded, and the greens are generally large and welcoming. The front nine are particularly gentle, while some difficulty comes into play by the time you reach the turn. The facilities here are 5* as you would expect within the Laguna Hotel complex which includes the famous Banyan Tree Spa and the restaurant, Banyan Cafe. Whilst this course is far from a pitch and put it is ideal for higher handicappers and couples. Medium length and straight off the tee will get you a good rewarding score here. The layout is nice and gentle with only the par 3 11th having a longish carry over water. The 9th plays to an island green, but just be smart and layup and you should have no troubles. The 17th is certainly long but play it one shot at a time, you get at least 1 shot if not 2 with your handicap so use them. 600 yards is still only four 7 iron shots of 150yards each to make a net par. Laguna likes to have some deep rough in and around the greens so the best leave is almost always short and straight – I saw a pro golfer bogey a par 5 after being pin high and 4 yards off the green in 2! The practice facilities for those last minute warm up swings are of a very high standard including 2 chipping greens one with a bunker, large driving range (using high quality srixon range balls) and a large putting green adjacent to the 1st hole. 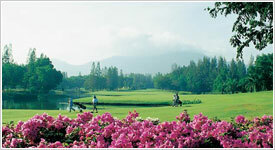 This par 5 was made a par 4 for the Singha Thailand open in 2009 so this hole – as with the first – provides golfers with a great chance to make par. The drive is important but you are hitting to a generous fairway and as long as you are on the fairway, ideally a little left of the right sided fairway bunker, you have a good shot in. You probably won’t reach the fairway bunker up on the right so aim for it, but too far right and the trees become an issue with the next shot. The line for the 2nd shot is almost always at the temple roof, but check with your caddie for the best line. From where you will be playing your second shot the green is uphill and around to the right, you can check your line by quickly walking up to the bunker and seeing the lay of land ahead. A good 3 or 5 wood will leave you with a wedge to the green. As always be straight with the approach as bunkers protect short and right and the rough can get long over on the left. Par par would be a great start! One of the more challenging holes on this resort course and a hole that I really like. It is rated as the third hardest hole so like the next hole I describe, don’t be afraid to use your handicap. There are better holes to make up ground on your card – believe me. A good drive sets the hole up nicely but there is a large water hazard down the right that is well within range with a driver. You can’t really see from the water from the tee,so think about a 3 wood if it is straighter for you. Once you find the fairway you will have a long iron or mid iron to the green. This green slopes heavily from back to front, so the ball should stop quickly on approach. The green is fairly narrow with bunkers then water down the right and a bunker to the left. Don’t be long as it leaves you with a very difficult chip back, down a sloping green from amongst trees and bushes. If you are short and straight with your approach, by no means a bad thing, just remember to give the pitch a little extra oomph as it has to go up a sloping green. As I said above – you get a shot here so use it (I doubt any scratch golfers are reading this!). Play this hole sensibly and you can tame the toughest hole on the course, be too aggressive and you can see a good round end up very wet. Take your favourite club off the tee – driver, 3 wood or even 5 wood. Good position is vital with water on both sides of the fairway and you are likely to be laying up with a mid or long iron with your next shot, so a long drive is not rewarded here. This hole alone makes the purchase of a yardage chart worth the money. Unless you are very short of the tee you now have to layup between two ‘fingers’ of water that poke into the fairway. Only by using the yardage chart will you really know what club to play – anything from a 5 iron to 3 wood is normal. Once you are safely over the first and laid up short of the second finger of water you have about 170 to the long narrow and fairly flat green – this is the time to remember that it is stroke index 1 and you have a shot. Take whatever club you hit straightest. There is water all the way down the right and it is very close to the green and trees crowd the left. 30 yards short and straight leaves a simple pitch on and 2 putt for a great net par. So a nice straight 8 iron is much better than a sliced 4 iron. Now, if only I could take my own advice!! !